Sometimes, you've just got to work with what you have. If you don't have the money for a full bathroom remodel, take this budget-friendly approach instead. If your bathroom is looking a bit dated but there’s no room in your budget for a full renovation, think in terms of small upgrades that’ll spruce things up. One such project is recaulking the bathtub, replacing the years-old discolored bead with new, fresh-looking silicone. Of course, the first step here is to remove the old caulk. You can do so by applying caulk softener and then letting it sit for a couple of hours (or for however long the instructions call for). 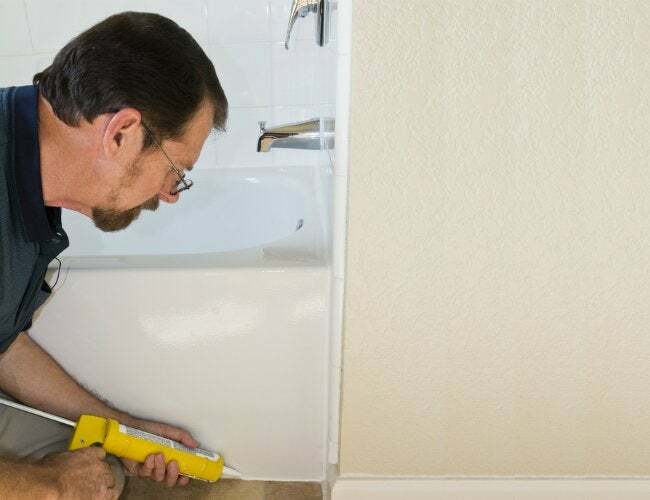 Once the old caulk has softened, use a stiff putty knife to remove it. Next, after getting rid of any remaining soap scum or debris, apply rubbing alcohol to kill any mildew that may be lurking. Once the area is dry, fill the bathtub with water to ensure that it’s fully settled. Finally, apply a new bead of quality silicone caulk, having made sure the product was specially made for bathrooms and contains mildewcide. That’ll help keep your tub looking clean and inviting for you and your guests.